August 1, 1998 was one of the most joyous days of our ministry! Our Cessna 206 was taking off for Africa to do her work. A Wonderful groups of people had gathered with us to see her off and after much fun and frivolity, everyone gathered around her and began to pray. She would be one of the most important pieces of equipment we would have to reach into the deep recesses of the land where the gospel had not penetrated, reaching...unreached people. We were devastated by that crash emotionally. 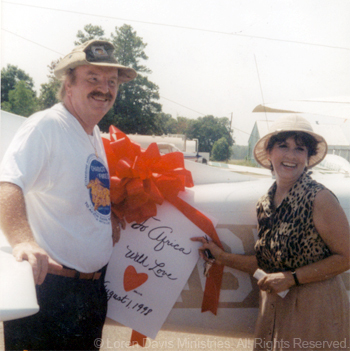 We had worked so hard to restore that plane to reach people with the saving message of Jesus Christ. It looked as if the dream had died, certainly the circumstances had tried to crush it out of us! But, just six weeks after that accident we got on a British Air flight and went back to work on a scaled down trip since we were still in a bit of shock over the events of the awful situation. What we did not know was that the Lord God was preparing a person's heart to sow a considerable seed into this ministry. Just a few days after we left for Africa, a check came into our office for enough to purchase a bush plane! In those days we didn't have cell phones to check in daily, and frankly, our office was a post office box holding our mail until we returned to the USA! So, it wasn't until weeks later upon returning home that we learned of the blessing of God in the form of a person whom we had barely met but who had a heart for souls!